Hugh Freeze's resignation is just the latest twist in the rollercoaster ride that has been Ole Miss's football program over the past decade-plus. Your football program is a fish. John Grisham’s editor probably would reject the story for being too unbelievable, but it’s all true. And the most salacious details have yet to leak. Ole Miss coach Hugh Freeze resigned before he could get fired Thursday, but not for the reason anyone would have expected him to resign. It would have made perfect sense had Ole Miss discovered violations of NCAA rules that would have doomed the program’s defense in the case that will go before the Committee on Infractions in the coming months. But according to chancellor Jeffrey Vitter, that isn’t why Freeze is out of a job. “We simply cannot accept the conduct in his personal life that we’ve discovered,” Vitter said. Neither Vitter nor athletic director Ross Bjork would reveal any specifics about this conduct, but this being 2017, that information likely will ooze forth at some point. What they made clear is that they didn’t push out Freeze for anything having to do with the NCAA’s case against the Rebels. This puts Ole Miss in an uncomfortable position. After digging in their heels for years defending Freeze, the Rebels can’t now flip on him and blame him for all their NCAA issues. They’ll have to continue to defend Freeze before the COI, because it’s too late to change tack. But before we examine the awkwardness of the Rebels’ current situation, let’s pause for a moment to unspool the soap opera that brought Ole Miss to this point. We know now that this all began 10 years ago with an open records request in Arkansas for the e-mail and phone records of a college football coach. Those phone records unearthed material that helped get Houston Nutt forced out as the head coach at Arkansas in November 2007. But Nutt didn’t stay unemployed long. Within days, he was named the head coach at Ole Miss. Nutt had two great seasons with players primarily recruited by Ed Orgeron. Then things started to spiral. By the end of a 2-10 ’11 season, Ole Miss leaders were so fed up with Nutt that they fired him and Pete Boone, the AD who hired him. They hired Freeze first to right the football program and Bjork next to raise the money. Freeze’s second recruiting class in ’13 drew huge stars and loud complaints from other programs that Ole Miss had broken the rules to get those players. The NCAA began sniffing around. Investigators found a few things from the Nutt era—including alleged ACT fraud—and more from the Freeze era. The investigation dragged on and seemed to be close to the end in January ’16. The NCAA enforcement staff was about to release the Notice of Allegations—the NCAA’s official charging document. With National Signing Day drawing near, stories and tweets began appearing suggesting that many of the violations happened during Nutt’s tenure and that few touched the Freeze era. When Ole Miss finally released the NOA during a Friday-before-Memorial Day weekend news dump, this was revealed for the spin it was. Many of the alleged violations involved offensive tackle Laremy Tunsil, one of the centerpieces of that ’13 class. Nutt, out of the game and frustrated at his inability to get back in, did not appreciate this spin. He demanded an apology. He did not receive one. So his attorney filed an open records request for the phone records of a college football coach in Mississippi. So what happens now? 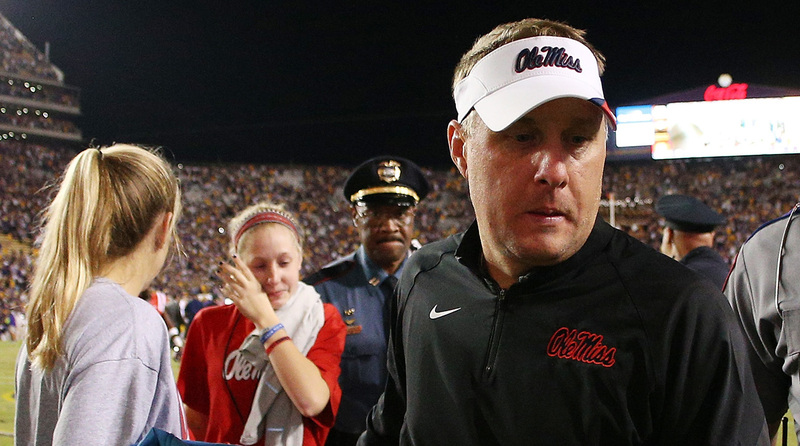 The Ole Miss brass has backed Freeze during every step of the NCAA investigation. The Rebels’ defense was designed to protect the coach who beat Alabama twice and led Ole Miss to two New Years Six bowls. When a second Notice of Allegations came in February packing far more serious allegations from the Freeze era than the first, Ole Miss probably could have jettisoned Freeze and earned a lighter sentence from the NCAA. That’s what Ohio State did with Jim Tressel, who was even more successful than Freeze but who got caught lying to NCAA investigators. Losing Tressel was a huge punishment in and of itself—most schools can’t turn around and hire Urban Meyer, but Ohio State lucked out—and the NCAA’s punishments hurt the Buckeyes in ’12 but didn’t keep them from winning the national title in ’14. Ole Miss doesn’t have that option now. Sure, the Rebels’ well-paid NCAA defense attorneys could dig up something to pin on Freeze and then try to shift all the blame to him, but at this late date the COI likely will be unmoved. More than likely, Ole Miss leaders will have to spend the rest of the case defending the guy they just chased off campus. Meanwhile, players who signed with Ole Miss in spite of the turmoil may want to leave now that their coach is gone. How does quarterback Shea Patterson feel now? His redshirt got burned last year after Chad Kelly’s knee injury, and now he’s going to play a season in which Ole Miss has already banned itself from a bowl game. If the COI hands down a harsh enough penalty to trigger the clause that allows players to transfer with no penalty, will he stick around? Should he? The Rebels will spend this season led by offensive line coach Matt Luke, who was a rising star and a potential future head coach before all this began. If he can keep this group—which should feature a high-scoring offense opposite a suspect defense—together, perhaps the Ole Miss alum will get a chance to lead the program permanently. Or maybe the Rebels will want a clean break from the Freeze era. After Thursday’s turn of events, it’s even more difficult to predict the next bombshell, but try this: Think of the craziest turn this saga can take, and then request some phone records. #DearAndy: Coach most likely to get ejected for two unsportsmanlike conduct penalties?